The law having a shadow of good things to come, and not the very image of the things, can never with those sacrifices, which they offered year by year continually, make the comers thereunto perfect: for then would they not have ceased to be offered? because that the worshippers once purged should have had no more conscience of sins. But in those sacrifices there is a remembrance again made of sins every year. For it is not possible that the blood of bulls and of goats should take away sins. Wherefore, when he cometh into the world, he saith, Sacrifice and offering thou wouldest not, but a body hast thou prepared me: in burnt-offerings and sacrifices for sin thou hast had no pleasure: then said I, Lo, I come (in the volume of the book it is written of me) to do thy will, O God. Above when he said, Sacrifice and offering and burnt-offerings and offering for sin thou wouldest not, neither hadst pleasure therein, (which are offered by the law;) then said he, Lo, I come to do thy will, O God: he taketh away the first, that he may establish the second. By the which will we are sanctified, through the offering of the body of Jesus Christ once for all. And every priest standeth daily ministering, and offering oftentimes the same sacrifices, which can never take away sins. But this man, after he had offered one sacrifice for sins for ever, sat down on the right hand of God; from henceforth expecting till his enemies be made his foot-stool. For by one offering he hath perfected for ever them that are sanctified. Whereof the Holy Ghost also is a witness to us: for after that he had said before, This is the covenant that I will make with them after those days, saith the Lord, I will put my laws into their hearts, and in their minds will I write them; and their sins and iniquities will I remember no more. Now where remission of these is, there is no more offering for sin. Having therefore, brethren, boldness to enter into the holiest by the blood of Jesus, by a new and living way, which he hath consecrated for us, through the vail, that is to say, his flesh; and having an high Priest over the house of God; let us draw near with a true heart, in full assurance of faith, having our hearts sprinkled from an evil conscience, and our bodies washed with pure water. Let us hold fast the profession of our faith without wavering; (for he is faithful that promised;) and let us consider one another to provoke unto love, and to good works; not forsaking the assembling of ourselves together, as the manner of some is; but exhorting one another: and so much the more, as ye see the day approaching. Pilate therefore took Jesus, and scourged him. And the soldiers platted a crown of thorns, and put it on his head, and they put on him a purple robe, and said, Hail, King of the Jews: and they smote him with their hands. Pilate therefore went forth again, and saith unto them, Behold, I bring him forth to you, that ye may know that I find no fault in him. Then came Jesus forth, wearing the crown of thorns, and the purple robe. And Pilate saith unto them, Behold the man! 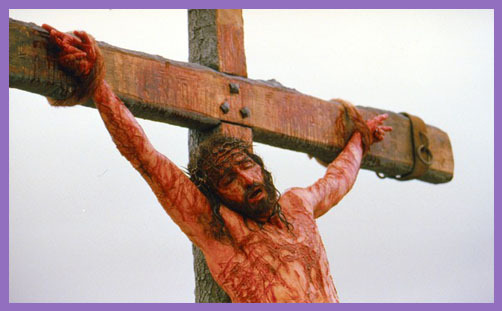 When the chief priests therefore and officers saw him, they cried out, saying, Crucify him, crucify him. Pilate saith unto them, Take ye him, and crucify him: for I find no fault in him. The Jews answered him, We have a law, and by our law he ought to die, because he made himself the Son of God. When Pilate therefore heard that saying, he was the more afraid; and went again into the judgement-hall, and saith unto Jesus, Whence art thou? But Jesus gave him no answer. Then saith Pilate unto him, Speakest thou not unto me? knowest thou not that I have power to crucify thee, and have power to release thee? Jesus answered, Thou couldest have no power at all against me, except it were given thee from above: therefore he that delivered me unto thee hath the greater sin. And from thenceforth Pilate sought to release him: but the Jews cried out, saying, If thou let this man go, thou art not Caesar’s friend: whosoever maketh himself a king speaketh against Caesar. When Pilate therefore heard that saying, he brought Jesus forth, and sat down in the judgement-seat, in a place that is called the Pavement, but in the Hebrew, Gabbatha. And it was the preparation of the passover, and about the sixth hour: and he saith unto the Jews, Behold your King! But they cried out, Away with him, away with him, crucify him. Pilate saith unto them, Shall I crucify your King? The chief priests answered, We have no king but Caesar. Then delivered he him therefore unto them to be crucified: and they took Jesus, and led him away. And he, bearing his cross, went forth into a place called the place of a skull, which is called in the Hebrew, Golgotha: where they crucified him, and two other with him, on either side one, and Jesus in the midst. And Pilate wrote a title, and put it on the cross; and the writing was, JESUS OF NAZARETH THE KING OF THE JEWS. This title then read many of the Jews: for the place where Jesus was crucified was nigh to the city: and it was written in Hebrew, and Greek, and Latin. Then said the chief priests of the Jews to Pilate, Write not, The King of the Jews; but that he said, I am the King of the Jews. Pilate answered, What I have written, I have written. Now there stood by the cross of Jesus, his mother, and his mother’s sister, Mary the wife of Cleophas, and Mary Magdalene. When Jesus therefore saw his mother, and the disciple standing by, whom he loved, he saith unto his mother, Woman, behold thy son. Then saith he to the disciple, Behold thy mother. And from that hour that disciple took her unto his own home. After this, Jesus, knowing that all things were now accomplished, that the Scripture might be fulfilled, saith, I thirst. Now there was set a vessel full of vinegar: and they filled a spunge with vinegar, and put it upon hyssop, and put it to his mouth. When Jesus therefore had received the vinegar, he said, It is finished: and he bowed his head, and gave up the ghost. The Jews therefore, because it was the preparation, that the bodies should not remain upon the cross on the sabbath-day, (for that sabbath-day was an high day,) besought Pilate that their legs might be broken, and that they might be taken away. Then came the soldiers, and brake the legs of the first, and of the other which was crucified with him. But when they came to Jesus, and saw that he was dead already, they brake not his legs. But one of the soldiers with a spear pierced his side, and forthwith came there out blood and water. And he that saw it bare record, and his record is true: and he knoweth that he saith true, that ye might believe. For these things were done that the Scripture should be fulfilled, A bone of him shall not be broken. And again another Scripture saith, They shall look on him whom they pierced. John brings us, through the depiction of the utter serenity of Jesus, to a point of silence. For Mark, Jesus is the Son of God; for Matthew, He is the King; for Luke, Jesus is the Saviour. But for John, this is the Lamb of God who goes to the slaughter like the animals in Hebrews, ritually bled so that no drop of blood remains in him but is poured on the ground. God so loved the world that He gave His only begotten Son, who was with Him at the creation of the world, to die the agonising death of a cursed criminal. The cross that killed the Son of God blotted out our every sin: that which was torture for Him was a sweet gift to us – the path to eternal life. On this Good Friday, let us meditate upon the man hanging on that cross. Our every selfish thought, our pride, our fits of anger, our lies, jealousy, greed and intolerance drove those nails into His feet and hands. Even in His deepest agony, he was forgiving us. The death of Christ brought his disciples to the very depths of despair: they were abandoned, mocked and disillusioned. And yet they possessed within their hearts the peace which passes all understanding: an assurance, a hope that their time of testing might pass and that the curse of death might be conquered. They did not know; they believed. And the message they believed has been central to the Christian faith for almost 2,000 years. It is one that has continually to be reinforced at times of stress, despair and danger; the moments when faith is tested and the will to overcome is undermined. This is why Good Friday is so central in its symbolism: the descent of darkness, the portents of destruction, the expiry of vision and hope. It is the Good Friday that comes to every person at different times, when failure robs life of all meaning, joy and love. It is the collapse of enterprise, confidence, relationships and dignity. It is the descent into Hell. And let us take a moment to remember that today, in the 21st century, Christians are still being crucified for their faith. The disciples of Christ are still enduring what Josephus referred to as “that most wretched of deaths”. Some are given the choice of converting to Islam, but most are given no choice at all. They are strung up on their cross in agony for the world to see. It is politics and power; religion and fear. In the Middle East, nothing seems to have changed in 2,000 years. We can know that they believe in the sure and certain hope of the Resurrection: it sustains them through the despair – we think; we imagine. This life does not promise the joy and ecstasy of Easter: that is for another place. All we can expect on earth is to be persecuted for the sake of righteousness: the world will hate us, but it hated Him first. Our sin brought Jesus to his death on Calvary. 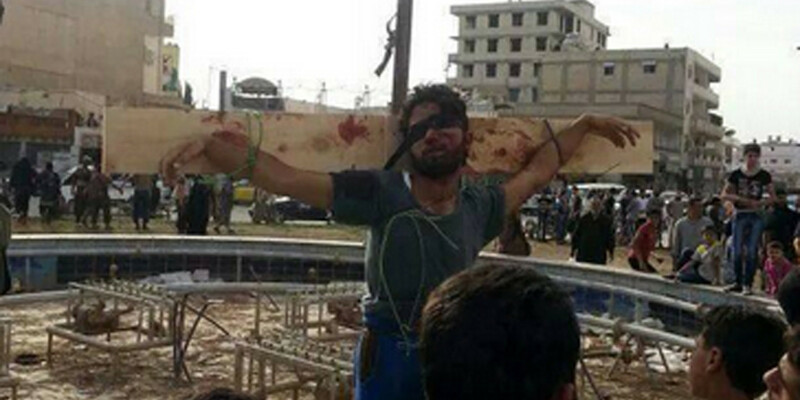 The Christian faith still brings believers to death on a cross. There is no retreat from messianic history: the cries of agony still reverberate around the world. Love so amazing, so divine, demands our souls, our lives, our all.